Porsche has shown a lighter version of its 911 GT3 RS at the New York motor show. The 911 GT3 RS Weissach pack (pictured with a black bonnet), as it is called, comes with a carbonfibre roof and the option of magnesium wheels. Buyers who specify the full pack will save 29kg, bringing the car's kerb weight down to 1476kg. This more extreme version is likely to be the last 991-based model to be launched before a new 911 (codenamed 992) is launched in September. The standard 911 GT3 RS was launched earlier this month in Geneva. 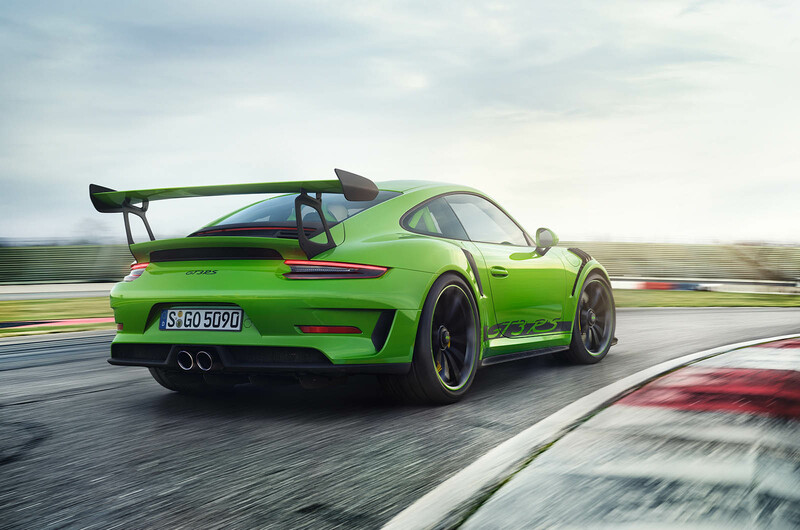 Available to order now at a price of £141,346, with first UK deliveries in June, the new 911 GT3 RS receives an additional 20bhp from a lightly modified version of Porsche’s race-bred 4.0-litre six-cylinder engine, increasing its power to 513bhp at 8250rpm. This is the highest power figure yet for a naturally aspirated 911 and serves to distance the new 911 GT3 RS from the standard 911 GT3, which was equipped with the same 493bhp engine as the first-generation 911 GT3 RS when it was updated last year. The internals of the new engine remain unchanged, with the additional power coming instead from new intake and exhaust systems, coupled with changes to Porsche’s DME (Digital Motor Electronics) engine management. Porsche motorsport guru Andreas Preuninger confirmed to Autocar that the engine actually develops more power than is claimed and could have been homologated at 523bhp, but the company decided to err on the side of caution. In racing trim, if allowed to run without air restrictors, the engine could make more than 600bhp. Like the previous 911 GT3 RS, the engine is mated to a seven-speed PDK double-clutch transmission and there is no option of a manual gearbox. The increase in power is claimed to shave 0.1sec from the outgoing 911 GT3 RS’s 0-62mph time, lowering it to 3.2sec, while adding 1mph to its top speed at 194mph. Modifications to the car’s chassis were informed by the knowledge gleaned from the 911 GT2 RS launched last year. The new 911 GT3 RS has the same spring rates front and rear as its turbocharged stablemate. At the front, those spring rates amount to double that seen on either the current 911 GT3 or previous 911 GT3 RS, and the rear spring rate has increased by 40%. Like the 911 GT2 RS, rose joints are used throughout the front and rear suspension, while the rear-wheel steering system has been extensively reprogrammed. All 911 GT3 RSs are fitted with carbonfibre front wings and bonnet (with new NACA ducts to aid brake cooling), as well as a magnesium roof. Visually, the new Porsche road racer is differentiated from its predecessor by a series of subtle aerodynamic and styling upgrades. They include new LED indicator lights set within a reprofiled front bumper. The bumper also features new vertical air flow guides within the outer ducts to more efficiently channel air to the front-mounted radiators and brakes. At the rear, there are more heavily structured rear lights, a new bumper with larger air extraction ducts and modified supports for the rear wing, which itself features newly shaped end plates. The interior has carbonfibre-backed racing seats, lightweight door panels with storage nets and nylon opening loops. Other weight-slashing measures include a reduction in sound absorption material and a lightweight engine lid. These modifications to the 911 GT3 RS should add up to an approximate 10-second improvement in Nürburgring lap time. The reason the new 911 GT3 RS is being rolled out after the GT2 RS rather than before it (which would seem more logical and follow the template set by the previous GT2 RS in 2010) is that Porsche was not prepared to wait until this spring to wrest the Nürburgring production car lap record back from in-house rival Lamborghini, so it launched its most extreme model first. I suppose hanging washed it so many times - stretched it tweeked it stitched it and generally finally run out of profitering draw outs they will rely on vile pain schemes - this is so effing horrible I want to throw up. Maybe they still make yuppies to buy one? I thought the 991.2 GT3 4.0L was significantly different from the engine in the 991.1 RS, hence the 9000rpm redline? While it is of course amazing I can't get excited over a car that is sold out and only available for a massive premium. Over a £140,000 for a revised variant of a car that will be replaced later this year. Another cynical marketing ploy by Porsche for the 911. It's not as if the 911 is a particularly special car or one that is made in small numbers, and will be replaced by an equally special new car, where such a new variant late in the car's life at those prices can be justified. I wouldn't be at all surprised if we see yet another variant of the 911 later this year with a hugely inflated price, may be one to celebrate the 991's final year in production. Please name me another car with this level of performance available for £140k. It’s a 911 (still the definitive sports car) with bespoke drivetrain, suspension, bodywork and aero. Either you understand the real value in that, or you do not. 996 the first generation GT3 RS? 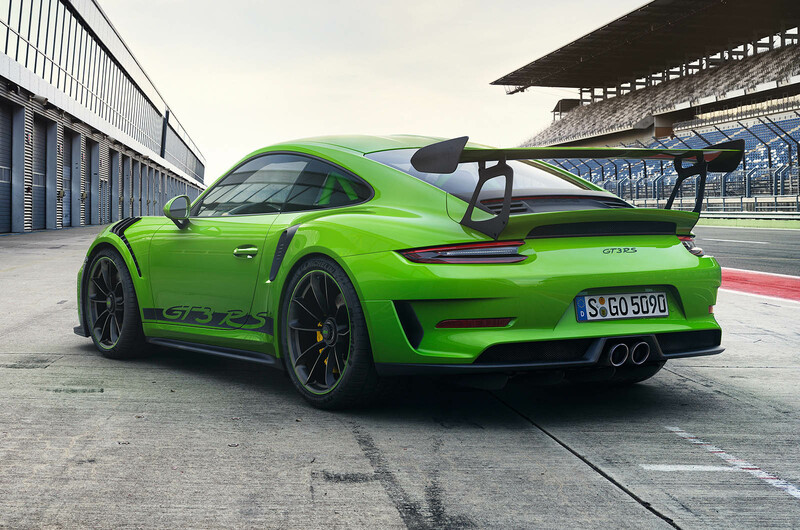 "equipped with the same 493bhp engine as the first-generation 911 GT3 RS when it was updated last year". I'm sure the first generation 911 GT3 RS was based on the 996 and had a 3.6 litre engine and went out of production over 10 years ago when the 997 GT3 RS came along? They're referring to the first-generation 991 it seems! Roadster, it seems that they're just refering to the 991.1 GT3 and GT3 RS having exactly the same power output, whereas the 991.2 gen cars are going to have 20 bhp difference. So rip out the standard air intake and it'll make 600 bhp? :) But amazing what they are doing with normally aspirated engines.